Aurora basic calculator HC-133. Class Kit of 30 units. Robust handheld model with durable hard keys. Features a large numeric keypad with an 8 digit LCD display. 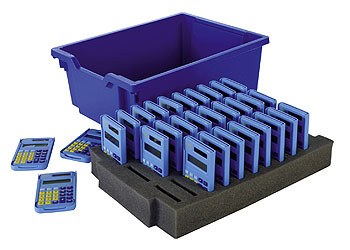 The class kit contains 30 HC-133 calculators in a Gratnells storage box with a foam insert to separate and protect each unit. 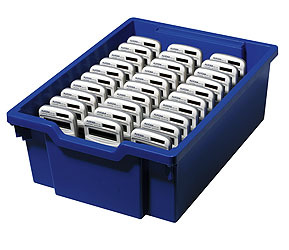 Fully compatible with the Gratnells storage system. Includes a FREE single user copy of PC-Calc emulator software! Hard slide-on case and durable plastic keys. Clear 8 digit LCD display, 4 constants and square root key. 3 Key memory and available solely in solar power. Aurora basic calculator HC-102. Class Kit of 30 units. 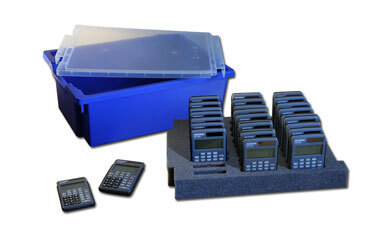 Aurora basic calculator EC240, Class Kit of 30 units. Robust handheld model with durable hard keys. Features a large numeric keypad with an 8 digit LCD display and is manufactured entirely from recycled plastics.